• Notched back-to-back double-digit kills in an upset win over No. 14 USC (3-1) and a loss to No. 25 UCLA (3-1). 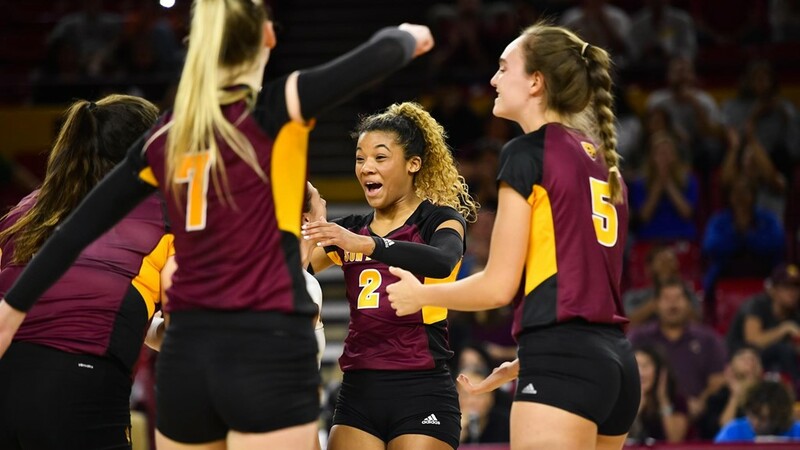 • Led ASU to its first win against USC since 2014 and its third win over a top-15 team this year with a match-high 25 kills on a .405 clip. • Tallied 20-plus kills in both matches this weekend and in four matches this season. Has notched double-digit kills in six-straight matches. • First player to be named the Pac-12 Offensive Player of the Week since Macey Gardner on Oct. 5, 2015 and just the second weekly honoree since then, as well. • Earns her first-career weekly honor and the 23rd all-time weekly honor for the Sun Devils. • Tallied a total of 27 kills, hitting .355 and 21 total blocks in back-to-back five set wins on the road over No.16 Oregon and Oregon State. • Broke the school record for blocks in a match with 17 in the victory over the Beavers. • Needs just a single block to tie the Buffs’ career record in blocks at 565. • Marks her third-career weekly honor and the ninth all-time for CU. • Notched back-to-back career-highs in assists with 55 against No. 16 Oregon (3-2) and 60 against Oregon State (3-2). • Tied a school record with 10 blocks in a match, as only the second CU setter to achieve the feat. • Only the second player in CU history to have a double-double with assists and blocks, and was just a pair of digs away from becoming the only triple-double recorded without 10 kills. • Earns second freshman weekly honor this season and the sixth all-time weekly freshman honor for the Buffs. Offensive: Devyn Cross, ARIZ; Mima Mirkovic, CAL; Alexa Smith; COLO; Willow Johnson, ORE; Amy Underdown, OSU; Tami Alade, STAN; Jenny Mosser, UCLA; Dani Drews, UTAH. Defensive: Makenna Martin, ARIZ; Courtney Leffel, ASU; Brooke Nuneviller, ORE; Grace Massey, OSU; Tami Alade, STAN; Zana Muno, UCLA; Kenzie Koerber, UTAH. Freshman: Brooke Nuneviller, ORE; Maddie Sheehan, OSU; Emily Ryan, UCLA; Megan Yett, UTAH.